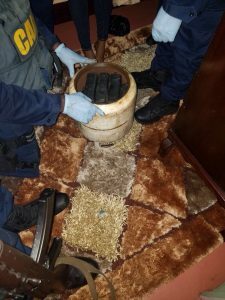 Tw o teenagers were Sunday arrested in connection with the alleged discovery of cocaine in a gas cylinder, the Customs Anti-Narcotics Unit (CANU) said. The anti-drug agency said the operation was conducted at 25 Delph Avenue, Campbellville, Georgetown. resulted in the seizure of nine rectangular shape objects weighing over nine kilograms of suspected cocaine found in a cooking gas cylinder. Two 17 year old occupants of the house at the time were both arrested and are currently assisting with investigation, the law enforcement unit of the Ministry of Public Security said. In the past, large quantities of cocaine have been found in kunds, fake awara, furniture and star-apples.